What’s so inviting about seeing weakness in others? 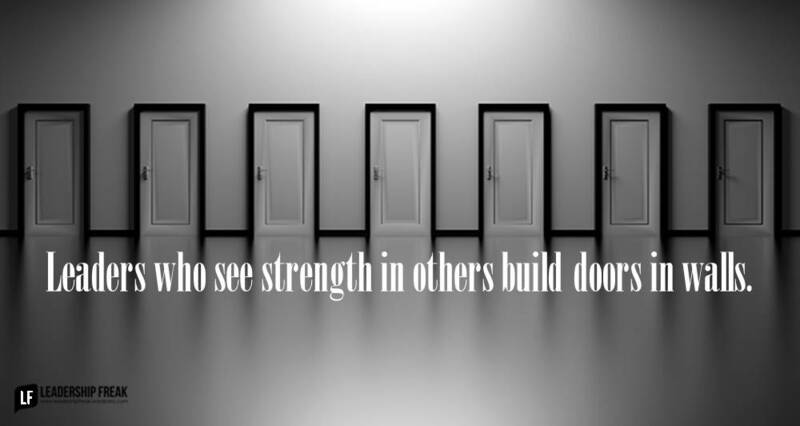 Leaders who see strength in others build doors in walls. #1. Speak directly to the heart. #2. Point out where people don’t serve themselves well. #3. Provide opportunity to reflect. #4. Come along side gently after failure. #5. See strength in others. Seeing weakness drains passion for growth. I turned to Nicole and said, “What you did with Kristina was very leaderly. Kristina did the best job she has ever done.” Tom, who sat across from Nicole, chimed his assent. We devalue our strengths because they feel easy. Our inner critic beats us down. Begin with what they do well. Growth doesn’t have to be about fixing. Ask how they might take what they do well to a new level. You did a great job. How might you do more of that? You’ve accomplished a lot. What if you’re selling yourself short? How might you bring your strength to a new situation? You’ve had people fixing you all your life. Try a new approach. How might leaders ignite growth by seeing strength in others? Dan, I just might never look at a wall the same, thank you. Ever wonder how many times a day we have positive thoughts about another and just do not communicate it. In our company we call them “positive withholds”. The process of thinking a positive thought and then willingly make the decision to not communicate it. We have opportunities each day to enrich people by making doors in walls – Dan, appreciate you! Thanks Scott. Love your way of expressing “positive withholds”. I think it happens more than we think. You have my best! Great lesson to be learned. A great leader should always look for the potential in followers and work towards bringing out what is on the inside. Great post. Thanks esteem. Where do we get the idea that seeing lack of potential in others inspires them. I have found that followers desire for the leader to acknowledge their gift -even help them to realize they have one. I’ve seen this as not merely a personal, individual issue, but become an institutional mindset, where the whole organisation devalues itself. It’s so destructive and dangerous!